Energy efficiency measures can increase your property values, reduce your electric bills, and create a more comfortable living environment in your home. There are a variety of financing options available to make it easier for homeowners and businesses to invest in energy efficiency. In most cases, you can get a personal (also known as unsecured) energy efficiency loan or an energy-efficient mortgage. Depending on where you live, you may also have access to on-bill financing that you repay through your utility electric bill, or you may be able to take out a PACE loan that you repay through your property taxes. Why use financing for energy efficiency improvements? Energy efficiency loans are similar to home improvement loans that homeowners have used for decades to build a deck or add a second bathroom to their homes. When a homeowner borrows money from a lender, they agree to pay it back, plus interest, in monthly installments over the loan term. Loans can be either equipment-backed or mortgage-backed, which results in a wide array of interest rates, term lengths, and credit requirements among loan offerings. However, in many cases energy efficiency financing comes with an extra qualification step. For energy efficient mortgages, PACE financing, and on-bill financing, you may have to get a home energy audit so that you can prove to the lender that your improvements will be cost-effective. There are four main types of energy efficiency financing options. Energy efficient mortgages (EEMs) are similar to a standard home mortgage in that they use your property as collateral for a loan. With an EEM, you can purchase or refinance a home that is already energy-efficient or you can purchase or refinance a home that will become energy efficient after energy-saving improvements. Learn more about energy efficient mortgages. Energy efficiency loans are unsecured loans, which means they don’t require your property as collateral. In practice, they are similar to the personal loans or lines of credit that you can take out from a creditor. Learn more about energy efficient loans. Unlike energy efficiency loans and EEMs, Property-Assessed Clean Energy (PACE) financing doesn’t require a monthly loan payment to a creditor. If you take out a PACE loan to fund your home energy efficiency improvements, you repay the amount owed on an annual basis as an assessment on your property taxes. Learn more about PACE for energy efficiency. Funding your energy efficiency projects doesn’t always require taking out a separate loan or refinancing your mortgage. 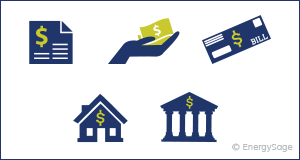 Many utilities offer on-bill financing programs that pair loan repayment with monthly energy bills to make it easier for homeowners and businesses to invest in energy efficiency improvements for their properties. Learn more about on-bill financing programs. Like any other financial product, energy efficient financing options have different structures, terms, and conditions. In order to find the financing option that is right for you, there are two fundamental questions that you need to ask. Energy efficiency financing can be divided into two categories. Secured loans require an asset that will serve as collateral for the loan – in most cases, that asset will be your home. Unsecured loans function more like a personal loan or line of credit and do not require your home as collateral. Both loan categories have implications for the borrower. The amount you want to pay each month will impact the interest rate and the length of the loan. Loans with longer terms will have smaller monthly payments, but you will pay more in interest over the life of the loan. 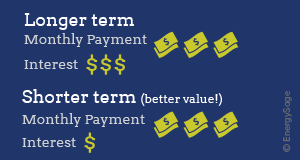 In contrast, payments on energy efficiency loans with shorter terms may exceed your monthly utility bill savings, but they offer a better value because you pay less in interest over the life of the loan. In addition to traditional banks, there are many other institutions that offer energy efficiency financing. Energy efficiency companies may offer loans, often through their contractor networks. Credit unions all over the country are developing energy efficiency loan products for homeowners, and often offer lower-cost energy efficiency loans. National lending institutions offer specialty loan products tailored to energy efficient buildings. Public-private partnerships can offer energy efficiency loan programs. Local government agencies partner with private lenders to offer energy efficiency with lower interest rates and no fees. Utilities offer on-bill financing programs that allow homeowners to finance energy efficiency improvements and repay the borrowed amount through electric bills.